The rules for landing a husband may have changed a little over the centuries, but the task still requires focus, proper maneuvering, creativity, flexibility, a lot of luck, and yes, let's admit it, some role-playing...at the very least with one's future in-laws. Perhaps this is why Oliver Goldsmith's classic Restoration comedy She Stoops To Conquer or Mistakes of a Night plays so well to modern audiences. Set up by her father with the smart, handsome, proper and commitment-phobic Marlow, Kate Hardcastle devises an outrageous stratagem for tricking her beau into obeying his true desires and fulfilling hers. Unfortunately for her and fortunately for us, everyone in the household seems to be hatching their own secret plots at the same time. Lies, both big and small, proliferate madly in the Hardcastle home, causing hilarious confusion and well-deserved predicaments. But surprisingly, lies, while very, very bad and to be avoided as much as possible, sometimes, miraculously, solve the very problems direct honesty cannot. 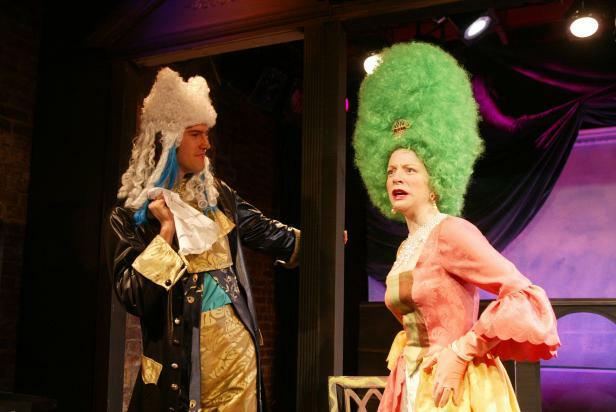 Inspired by both the high comedic style of the 18th Century and the girl punk bands of the 1980s, She Stoops to Conquer is directed by Artistic Director Marshall Mays, assisted by Todd Allen Durkin, and opens May 3, playing through May 19 at the 78th Street Theatre Lab. The set is designed by Scott Aronow, lighting by Michael K. Berelson, costumes by Anthony Catanzaro, with original music by Donna Heffernan and additional sound design by William Cusick. Jessica Forella serves as the Production Stage Manager. Andrea Alton (Landlord/Maid) Andrea Alton is thrilled to be working again with the Kaleidoscope Theatre Company again. She previously played Doctor Four, Woman Patient and Clown in Reckless with Kaleidoscope. New York credits include Erostratus, Museum, Naomi In The Living Room, Woman Stand Up, Please Do Not Disturb, The Lottery and Control-Alt-Delete. Regional favorites include Blue Window, Baby With The Bathwater and Never In My Lifetime. Film: Target Audience, Kaleidoscope, Tattoos and The Magician. Andrea has performed stand up at such clubs as Caroline's and the Duplex and has also performed Sketch Comedy and Improv at various places throughout the city. Many thanks to Marshall and the fabulous cast and crew. *Michael Joseloff (Mr. Hardcastle) NY theatre includes: All Talk, Woyzeck, Coriolanus, The Brothers Karamzov (LaMaMa). Vampire Stewardesses From Hell (Dysfunctional/St. Marks Theatre); Ice Island (78th Street Theatre Lab); 68 (Nada). NYC Fringe: Speakeasy, Intervals, All Talk. Film & TV: The Colin Quinn Show, Saturday Night Live (NBC 2001/2002 seasons); 40 Days and 40 Nights (Miramax pre-promotion); AMC's American Pop. Member, Todd Theatre Troupe. Ian Oldaker(Mr. Marlow) Ian Oldaker is thrilled to finally be working with Marshall and Kaleidoscope. Ian graduated last year from the MFA in Acting Program at Brooklyn College and since has appeared as Orsino in Twelfth Night for Prospect Theater Co., Valentine in The Two Gentlemen of Verona (Valentine) for Shakespeare in the Wild, and Neoptolemus in The Cure at Troy at Blue Heron Arts Center. At Brooklyn College, Ian was featured in A View From The Bridge, Brighton Beach Memoirs, Three Days of Rain, You Never Can Tell, The Lover, I Hate Hamlet, and Our Country's Good. Much love to Mom, Dad and Katie and all those whom he holds close and dear. Joe Ponessa (Third Fellow/Roger/Jeremy) Joe Ponessa is appearing in his second Kaleidoscope Theatre Company production having appeared as Corin in As You Like It. In fact, apart from occasional readings over the decade, Joe is appearing in only his third NY production since taking a 14-year hiatus from the stage to work on Wall Street. Prior to that, Joe had a brief acting career in Houston, appearing in The Real Inspector Hound, The Ancestor and Working, all with Main Street Theater. Najla Said (Miss Hardcastle) Najla Said is happy to be performing in another Kaleidoscope production, after appearing this fall in Travis Baker's God & Mr. Smith. Other credits include Salome in Salome (Lincoln Center Directors Lab), Nerissa in The Merchant of Venice (Fractured Atlas), Hamlet in Hamlet (Expanded Arts). She has also worked at New York Theatre Workshop and the Immigrants Theatre Festival. Film: The Seige, The Contestant, Femme Fatale, Exit 8A. Television: Party of Five. Najla can also be heard as the voice of "Jennifer Love Houston" in Mean Planet, a cartoon series (scifi.com). Training: The Shakespeare Lab at the Public Theatre/NYSF, The Actors Center. Najla is a graduate of Princeton University. *Celia Schaefer (Miss Neville) Celia Schaefer was last seen as Cat in the fabulous existential southern-gothic absurdist comedy (! ), Morning Milking, Evening Milking at Theater for the New City. Other New York credits include Hell's Kitchen Sink at Ensemble Studio Theatre, Wonderful Party at Atlantic Theater Company, and The Changeling with King's County Shakespeare Company. She is a founding member of New Avenue Theatre Project where she has appeared in Heterosexuals and Four Notes And A Blender. Celia has toured with the nationally-acclaimed improv company, Chicago City Limits, and is a graduate of the North Carolina School of the Arts. *Robert Steffen (Diggory/Fourth Fellow) Robert Steffen was most recently seen in the Public Theatres production of Othello. Other New York stage credits include Trofimov in The Cherry Orchard, Parolles in All's Well That Ends Well, Philip French in Juliet, Tasuke in Benten Kozo, Tom in This Property is Condemned, Quinn Horton in Six Lead Soldiers, and Ben in Traveling Companions. Film work includes Charlie Tucker in Suicide Doors and Spike Lee's Bamboozled. Dan Truman (Sir Charles Marlow/Second Fellow/First Servant) Dan Truman is chuffed to make his debut with Kaleidoscope. Favorite recent credits include: Clitandre in The Misanthrope, Lucky in Waiting For Godot, and Malvolio in Twelfth Night (Pilot House), and Ned in Farmageddon, a Riant Theatre One-Act Festival Finalist. Mr. Truman is a graduate of NYU's Tisch School of the Arts and has studied at The Royal Court Theatre. *Roxanne Wellington (Mrs. Hardcastle) Roxanne Wellington holds a MFA from Wayne State's Hilberry Theatre, where she ran the rotating repertory gamut from Rose of Sharon and Ophelia to Lady Macbeth and Heidi in The Heidi Chronicles. Regionally, she received the Detroit News Best Actress Award for Viola in Twelfth Night, under the direction of Stratford Festival of Canada's Antoni Cimolino. NY credits include stints at P.S.122, Vital Theatre, Hudson River Classics, and others too shameless to name. Personally, Roxanne is a Stephen Gall groupie, and professionally a Wynn Handman devotee. She is giddy and grateful to Marshall Mays for this fantastic challenge and opportunity. Marshall F. York (Mr. Hastings) Marshall York is grateful to be working with everyone involved with Kaleidoscope. Marshall's last to-do was at the Kraine Theatre where he laced up his all-white jazz shoes and pondered Einstein's Dreams (NYC Fringe award winner). This past summer, he made his television debut on PBS, providing a handful of the most erudite (and heavily-edited) insights you've ever heard about Harold Pinter's pauses. Other credits include Henry Carr in Tom Stoppard's Travesties and Orsino in Twelfth Night (Lovinger Theatre). A graduate of the Actors Studio Drama School, where he studied with Susan Batson and Jack Gelber, Marshall was cast in productions of Hotline, Sweeney Todd, Loveliest Afternoon of the Year, The Lover, Breakfast at the Track, and No Exit. Thanks to Henry Wallengren, wherever you may be. Marshall is from Houston, Texas, y'all. * Appearing courtesy of Actors' Equity Association, the association of professional actors and stage managers in the United States. Marshall Mays (Director/Artistic Director/Maintenance Guy) Marshall Mays is the founder and Artistic Director of the Kaleidoscope Theatre Company. This past October, he directed the enthusiastically received premiere of God & Mr. Smith by Travis Baker. Last season, he directed Kaleidoscope's highly acclaimed productions of As You Like It and Craig Lucas' Reckless, and in the previous season, he directed Laura Henry's The Game, Christopher Renstrom's Unearthed, and the premieres of Liz Bartucci's The Calling and Keith Merritt's The Stairwell. He has directed five critically acclaimed productions at the Theatre Outlet in Allentown: Reckless, Clifford Odets' Waiting for Lefty, Terrance McNally's Frankie and Johnny in the Clair de Lune, the world premiere of Renstrom's Zion, and Steve Martin's Picasso at the Lapin Agile, which Paul Willistein of "The Allentown Morning Call" described two years later as a "landmark production." He has also directed new plays for PA Stage Company's New Evolving Works program and The Blueprint Company at New York City's First Annual Fringe Festival. Marshall is also the author of Dance in the Giddy Circle, which was the hit of the First Annual Festival of New York Plays at Synchronicity Space and was subsequently produced at the Trilogy Theatre in 1996. As an actor, Marshall has appeared in over 50 productions including work at the Gene Frankel Theatre, the Mint Space, the Abingdon Theatre, the Pennsylvania Stage Company, the Houston Shakespeare Festival, Stages Repertory Theatre and Main Street Theatre in Houston. He earned his MFA in Acting from Penn State University and holds a Bachelor of Architecture degree from Rice University. Todd Allen Durkin (Assistant Director) Mainly an actor, Todd Allen Durkin trained at New World School of the Arts/UF in Miami. Theatrical Acting credits include: Much Ado About Nothing, Midsummer Nights Dream, The Tempest, Hamlet in Hamlet, Riff-Cat Polito in The Virtual Adventures of Riff-Cat Polito, Beggar on Horseback, Salt Water Moon, Agamemnon, and Lenny Bruce in Julian Barry's Lenny, for which he was nominated for a Carbonell Award and Named Best Actor in a Comedy by the Miami New Times Magazine. Todd has worked with such companies as Theatrix, Vital Theatre Company, Millennium Stage Company, TheatreworksUSA and Peccadillo Theatre Company. Although the Assistant Director on She Stoops to Conquer, Todd has been seen as an actor in three Kaleidoscope productions, Emerson in The Stairwell, Touchstone in As You Like It and as The Postman in God & Mr. Smith last fall. Past directing credits include The House of Atreus, Oleanna and Christopher Durang's Laughing Wild, included as one of the 10 best productions of 1997 by The Miami Herald. Todd has appeared in numerous comedy clubs throughout the east coast including Caroline's Comedy Club here in NYC. Television and film credits Include: Toothpaste, Reindeer Games, America's Most Wanted, Ghost Stories, Golf balls (nationally released at Blockbuster), and Vote Early, Vote Often, a finalist in the Hollywood Film Festival, which is currently enjoying a very successful run on the International Film Festival Circuit. Jessica Forella (Stage Manager) This is Jessica Forella's third show with Kaleidoscope and she is delighted to be back. Previously she stage managed their production of Shakespeare's As You Like It and was the Assistant Stage Manager for Reckless. Jessica work has been seen lately with the St. John's University Chappell Players in such productions as Bye, Bye Birdie, Oedipus Rex and A Midsummer Night's Dream. She would like to thank Marshall for giving her the opportunity to work with Kaleidoscope again. Robert Blumenfeld (Dialect Coach) Robert Blumenfeld is an actor and the author of Accents: A Manual for Actors (Limelight Editions, 1998). He was the Dialect Coach for Broadway's Saturday Night Fever and The Scarlet Pimpernel and for Off-Broadway's MoisÃ©s Kaufman's Gross Indecency: The Three Trials of Oscar Wilde, for which he also created the role of the Marquis of Queensberry. He has recorded more than 250 Talking Books for the American Foundation for the Blind. Scott Aronow (Scenic Designer) Scott Aronow is proud to be working with the Kaleidoscope Theatre Company for the third time, having previously designed God And Mr. Smith and As You Like It. Other New York designs include Richard II at the Eleventh Hour Theatre Company at HERE!, On The Hills Of Black America for Imua! Theatre Company, also at HERE!, Life In Exodus at The Clemente Soto Valez Center, The Prime Of Miss Jean Brodie, Little Shop Of Horrors and The Curious Savage at the Brooklyn Friends School, Crazy For You for Scarsdale Summer Music Theater, Betsy Blue Or I Was A Nine-Year-Old Blues Diva at the Looking Glass Theater, The Boyfriend for the Dicapo Opera Theater Children's Chorus and How To Succeed In Business Without Really Trying, for the Putnam Valley Players. Scott has assisted and painted scenery for major designers at The Williamstown Theater Festival, New Jersey Shakespeare Festival, Hartford Theaterworks, and worked with designers John Lee Beatty and Heidi Ettinger (on the Broadway production of Tom Sawyer). Outside New York, he has designed Travels With My Aunt at the New Jersey Shakespeare Festival, The King And I, at the Palace Theater in Manchester NH, Grease and Brigadoon at the Lakes Region Summer Theater, Meredith NH, and Mad Forest at the Boston University Theater, where Scott received his BFA in Design, in 2000. Michael K. Berelson (Lighting Designer) Michael K. Berelson's credits include Rubber Ville (Ovo Productions), Naked Angels (PS/NBC Space@ HERE), Andy Ohio Meets The World (Queer @ HERE), Tallahassee (Ant farm/78th Street Lab), Crazy for You (Scarsdale Summer Music Theater). Off Broadway: TheaterWorks' Reading Rainbow (Assistant to Mark O'Connor). Regional: Ah Wilderness (Purchase Theater Ensemble) TEA at the Pittsburgh Public Theater (Assistant to Pat Collins), Ctrl+Alt+Delete at the George Street Theater (Assistant to Jeff Croiter). Dance: Moscow Ballet US National Tour, Passion Y Arte Flamenco Co., Tere O'Connor's Life is a Missing Girl (Assistant to Brian Macdevitt) and is the SM/Lighting Supervisor for the Jennifer Muller/The Works Dance Company. Michael designed As You Like It and God & Mr. Smith and is the Resident Lighting Designer for the Kaleidoscope Theatre Company. Anthony Catanzaro (Costume Designer/Managing Director/Seamstress) e's back! (Actually, he never left.) Having designed costumes for two earlier Kaleidoscope productions, As You Like It and God & Mr. Smith, Anthony would like to thank Artistic Director Mays and his company for providing the fodder for his new behind-the-scenes tell-all book entitled Seam-Stress: A Costumer's Memoir. Additionally, Anthony would like to acknowledge the inspiration provided by the Vivienne Westwood Collections (1990-1995). Actually, Anthony is very appreciative that Miss Westwood has not instituted suit to halt his blatant plagiarism. Most of all, as Managing Director of the Kaleidoscope Theatre Company, Anthony offers his thanks to our audience and donors for their support and to the many, many people who add buoyancy and charm to our productions through the gifts of their time and creative talents. Irwin B. Kroot (Casting Director/House Manager/Receptionist) Irwin B. Kroot is thrilled to have been involved with all of the Kaleidoscope productions since the inception of the company. He has done casting for, acted in, stage managed, and/or crewed more off-off Broadway productions in New York City over the past 15 years than he can remember. He's also always on the lookout for new talent - so if you're an actor who wants to work on exciting Equity Showcase productions, get the Kaleidoscope mailing address from our website (www.kaleidoscopetheatre.org) and send in a headshot and resume for consideration for future projects. Not only as a dialect coach but as a person, I speak French, Italian and German all fluently. I have smatterings of Spanish, Yiddish and Russian. Can you tell the difference the accents in central North Carolina and eastern South Carolina? Yes, there is actually a difference and I can tell because I did dinner theatre down there in both areasâŠ there was a circuit and I did notice the difference -- even back then before I was a dialect coach. 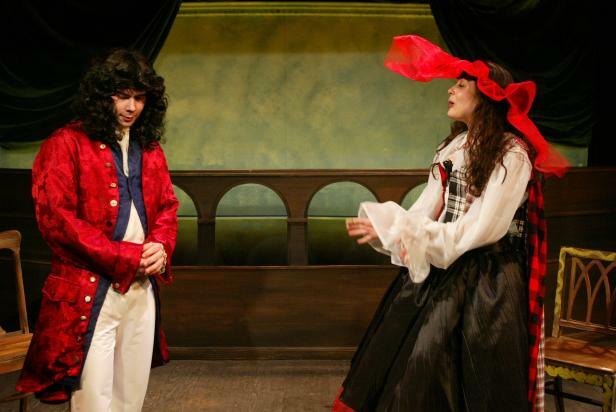 What kind of work did you have to do with the cast of "She Stoops To Conquer"? What dialects are involved? How is Restoration different from other period pieces? First of all "She Stoops" is not "Restoration". It is actually an 18th Century play which is after the "Restoration". It is during the Hanoverian period, in fact. The "Restoration" period is still part of the Stuart monarchy. Now for "She Stoops", the accents are, well, firstly, we actually do know how people spoke in the 18th Century. There are a number of books from the period, but there is no point really in going for an 18th Century accent which means nothing to the modern audience. We actually go for the upper class characters a sort of standard upper class British.. the kind you would hear in contemporary times, but form the movies of the 1940s and 1950s. And then for the servants, who are from the West country, have a provincial accentâŠ. a West country accent. I think these are the two main accents, but there is also a servant from London, Jeremy, and he is doing a London "cockney" accent. As far as my work with the cast, first of all they are already experts at the upper class accent. Occasionally, I have to give a note when one has a slip with a word and do a little other coaching as well, but they really do them superbly. I had to go for the West country accent pretty much from scratch, but the cast, those who are doing those parts, have excellent ears and they really picked it up right away. The guy who is doing the cockney accent really already knew the accent. I just had to give a couple of pointers. Is everyone trainable, or do actors really have to have a good ear for languages to be able to speak authentically in a dialect not their own? It really helps to have a good ear, of course. Everyone is trainable, but some people seem to be more quickly and easily trainable than others. In this cast, everyone is quite excellent. How did you get involved with Kaleidoscope? I knew Marshall for a long time. We used to go to the same gym and we became acquainted there and we would sit and talk. We kept in touch, even though he no longer goes to that gym. He spoke of starting this company and I thought, "well, this is great." Then I started to attend readings at his apartment, and of course, I have seen the productions, and sometimes I participated as actor because much of my career has been that of an actor, as well. Hmmm... I'll have to get back to you on that one. Because we're always in a hurry, New Yorlers developed their own glossary of Newyorkisms. For example, "Jeetyet" is a New York for "Did you eat yet?". Do you have a favorite Newyorkism? Well, let me seeâŠ "awrightaready". I guess I like that one. That is so New York to say "awright". Why is that living in New York is a good thing, but sounding like you're from New York is a bad thing? Living in New York is a good thing because in this incredible city there is so much that is wonderful going on here. Anything you are interested in, and all the arts, music, the theatre, et cetera. And if you like restaurants, this is one of the great restaurant cities that I have ever been to and I have spent lots of time in Paris, which is a fabulous restaurant city. As for talking like a New Yorker as being a bad thing or something to look down at is pure snobbery that people look down at certain accents. Is there any accent you do not particularly like to coach? There is no accent I would not like to coach and there is no accent I would like to see disappear from memory. Finally, is "Foster's" really Australian for "beer"? No, but you could put another shrimp on the barbie (in Australian accent)! How did you become a dialect coach? When did your interest begin? I began to do accents when I was about 4 or 5 years old listening to Gilbert and Sullivan recordings and imitating the British accents. Then I majored in languages in school. I have a BA and an MA in French. When I wasn't always getting work as an actor, I decided to coach my friends privately and they would give a little bit of money for it. One friend of mine who was the head of the speech department for the National Shakespeare Conservatory ask me if I'd like to design a course and teach accents because he thought I'd be good at it and I did. The class notes that I took for that and my teaching at the Stella Adler Conservatory formed the basis of the notes for my book, which was published by Limelight Editions in 1998. A book called, "Accents: A Manual for Actors" which comes with a compact disc. The second revised, expanded edition is coming out shortly with a second compact disc and 120 new pages and lots more practice exercises with such additions as the American accent of early 1900s and how to pronounce Latin correctly -- there are two different systems -- church Latin and classical Latin, et cetera. What recordings have you been referring to for the 19th Century accents? There are recordings people who were born much earlier. For instance, the 1912 presidential campaigns are recordedâŠ speeches are recorded that are now available on a compact disc. These people were born in the 19th Century -- something like 1870 or so -- and they learned to speak in that century. An opera singer, such as Emma Aimes was born in Maine in the 1860s and did a recorded interview in 1936. There are recordings of such famous people as Arthur Conan Doyle, Alfred Lord Tennyson, and other famous Victorians -- so we know how they talked. We don't necessarily know how they spoke in the 18th Century, aside from the books we mentioned, however, you can certainly extrapolate. These people are not so removed from their grandparents' generation. The speech cannot be that different, until you get to another century or so farther back where there was a great phenomenon called, "The Vowel Shift" which made Elizabethan English what is was and that is not quite understood by linguists. You mentioned Emma Aimes -- a woman born in Maine but lived her life a part from her surroundings. Could you extrapolate a truly Maine accent from that period by her recorded interview in 1936? A very good question. In fact there is not a Maine accent at all in her speech, but what I would call a "Diva" accent, which all the opera singers would have had. So, she learned good upper class American speech of that period. This is her accent. If you were doing a reading of Edith Wharton or Henry James play, for example, you would want to perhaps sound something like one of those people. It is interesting how one's livelihood or career would affect an accent. Yes and I have, in fact, analyzed a speech of the presidents who recorded for the campaigns and speak of Emma Aimes in my book. So that is in the new editionâŠ not the old edition. Have you coached for film? I have done some coaching, but not very much. Most of my work has been for theater. I have done Broadway shows -- The Scarlet Pimpernel (the third version) and Saturday Night Fever, as well. Also, Gross Indecency -- The Three Trials of Oscar Wilde in which I created the role of the Marquess of Queensbury. I did so for 8 months. I enjoy the accents of Scotland, Ireland and England. But I find all accents interesting and accents in other languages fascinating. I can do quite a number of French accents, for instance. Like every language, French, Italian -- my goodness, the situation linguistically is particularly fascinating for the dialects spoken there. There are 16 different native accents in Italy -- the Veneto, Tuscany, the south or so forth. The Sicilian accent is almost another language, as is Sardinian, which is the closest to Latin. I have also recorded more than 260 books for the American Foundation for the Blind. And in recording the fiction, I have to use a lot of accents and in recording the non-fiction, I have to be able to pronounce a great many languages correctly.